Stephen Hawking, in The Grand Design, argues that God did not create the universe. One review of the book states its aim as "to banish a divine creator from physics". The Biblical stance is that all things were created by God (Gen 1:1, Is 42:5, Eph 3:9...). Are there any books or articles written with a Christian world view as a foundation that address and incorporate what physics has to say about the cosmos, but still make a strong case that all things were created by God? Such a response, written in a way that makes sense to somebody like him, but that remains firmly Biblical, would be a fascinating thing to read. 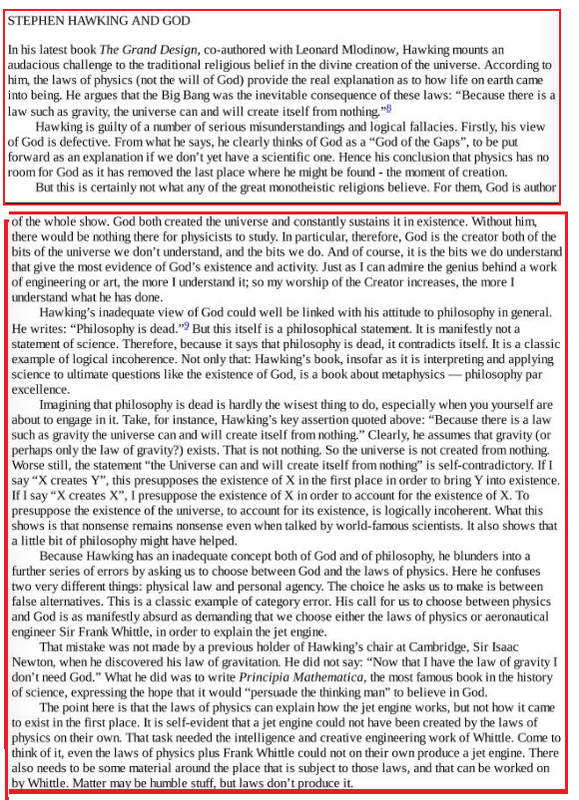 God and Stephen Hawking, by John C. Lennox, is a popular direct reply to The Grand Design. Alister McGrath calls it "a brilliant response," and the book won an Award of Merit in Christianity Today's 2012 Book Awards. Whether it "makes sense," as you say, to Hawking, is perhaps debatable. But Lennox is no slouch: he's a Professor at Oxford University, prominent Christian apologist, and author of many books. Nonetheless, the most prominent direct response to Hawking's book appears to be Lennox's God and Stephen Hawking. 1. Other similar resources are listed on Apologetics 315. John Lennox's book: Gunning for God - Why the New Atheists are Missing the Target directly covers and quotes this exact passage from Hawking you quoted, and addresses it. I am reading it at the moment. The Last Superstition By Edward Feser addresses this. Not the answer you're looking for? Browse other questions tagged creation apologetics science christian-literature existence-of-god or ask your own question. Why aren't any dinosaurs written in the bible?